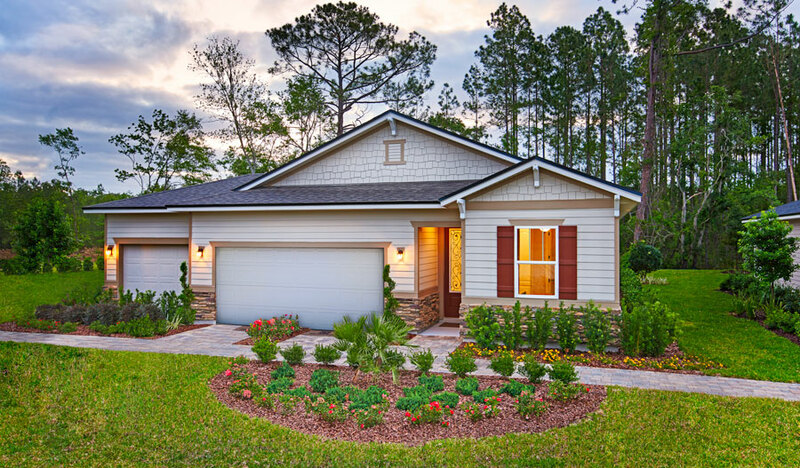 Our new collection of floor plans is the perfect fit for the Jacksonville area. 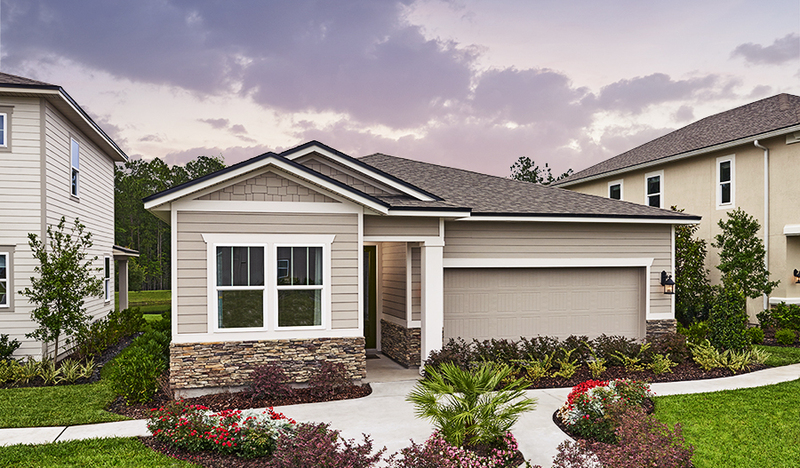 Only built at select locations, this exciting series of homes offers a versatile variety of features—all at an amazing price point. Principal and interest, and estimated taxes, hazard insurance and monthly mortgage insurance premiums are all calculated in the above payment. Call 888.500.7060 to learn more. 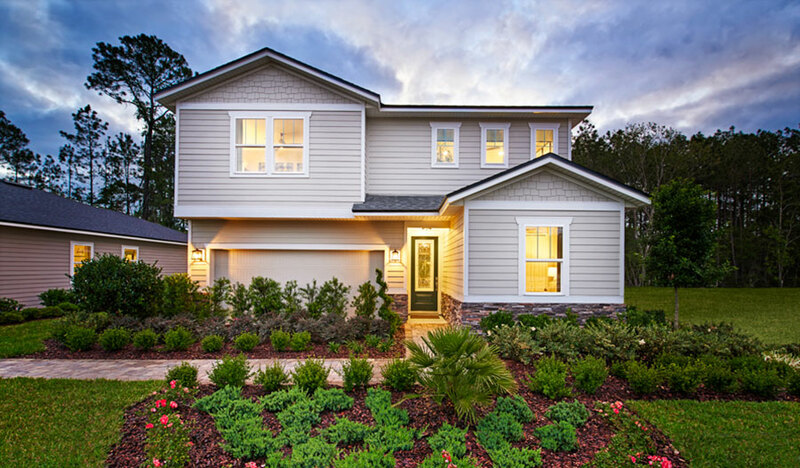 * Financing is provided by HomeAmerican Mortgage Corporation. HomeAmerican Mortgage Corporation’s offices are located at 5775 DTC Boulevard, Suite 300S, Greenwood Village, CO 80111 (NMLS Unique Identifier #130676; NMLS Consumer Access website: http://www.nmlsconsumeraccess.org), 866.400.7126. Example is based on a sales price of $201,950and a 30-year FHA fixed-rate loan with an interest rate of 5.125% and a 3.5% down payment. The total loan amount, including the upfront mortgage insurance premium, is $194,881.75. Monthly payment including principal, interest, taxes, mortgage insurance, and hazard insurance = $1601.26. APR = 6.21%. Taxes, monthly mortgage insurance premiums, and hazard insurance are estimated in the above monthly payment example and actual payment may be higher. Financing is available to owner occupants only and is subject to availability, a debt-to-income ratio of 43% or less, a maximum 96.5% loan-to-value ratio, FHA maximum loan limits, qualification using full documentation and a minimum FICO score of 640. Interest rate is not guaranteed and is subject to change without notice. The Richmond American Homes companies (RAH) and HomeAmerican Mortgage Corporation (HMC) are owned, directly or indirectly, by M.D.C. Holdings, Inc. and, therefore, are affiliated companies. RAH and HMC offer services independently of each other, and if you obtain a product or service from one company, you are not required to utilize the services of, or obtain products from, the other company. Your decision to use a company that is not affiliated with RAH or HMC will not affect your ability to obtain products and services from these companies. Prices, specifications and availability are subject to change without notice. Square footage is approximate. Dates and times are subject to change without notice. Actual homes as constructed may not contain the features and layouts depicted and may vary from image(s). ©2018 Richmond American Homes, Richmond American Homes of Florida, LP, CBC1257429.